Nollywood actress Funke Akindele baby news is now trending on the social media not for good but the other way round. Another story is developing less than 48 hours after a fan wrote NG that Funke Akindele has travelled to the UK to deliver her baby. The report is that Funke Akindele might have lost her pregnancy. 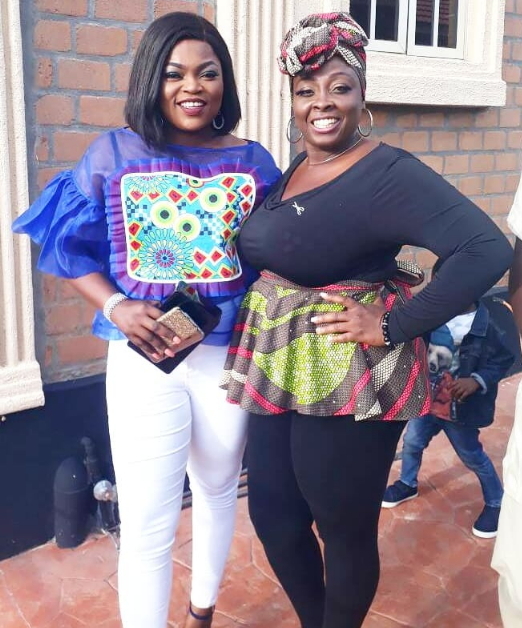 The negative news was triggered by Wazobia FM OAP Omotunde Akinbowale aka Lolo1 when she uploaded a photo of herself with Funke Akindele at a party. The actress was seen with no obvious sign of pregnancy, an indication that she might have suffered late term miscarriage. Here is how Lolo1 captioned the above photo of her and Funke Akindele. The photo was taken few days ago at the 50th birthday party of Amen Estate CEO, Babatunde Gbadamosi. When NG shared this report with the fan who told us she is in the UK to have her baby, the lady said may be she was there to do D&C. Dilation and curettage (D&C) is the most common surgical procedure performed to stop bleeding and prevent infection in late term miscarriages. An insider who is still confused as to how Funke Akindele lost her 6 and half month pregnancy promises to get back to us. It is really sad that what a Lagos Prophet said about her may be coming to pass. In January, 2017, the founder of the Mountain of Blessing and Miracle Church of Christ, Dr. Olagorioye Faleyimu, prophesied that Funke might not have children unless she married a Pastor who can fight the battle for her with prayers. We hope Funke Akindele breaks her silence and address this viral report at her earliest convenience. It is well with her.